Let’s continue with some more fall love and celebrate this season. As the weather is changing and the days are getting shorter and cooler, I am starting to crave more hearty comfort foods… like stew. It’s time to dust off the slow cooker and make some chili – slow cooker sweet potato chili to be specific. 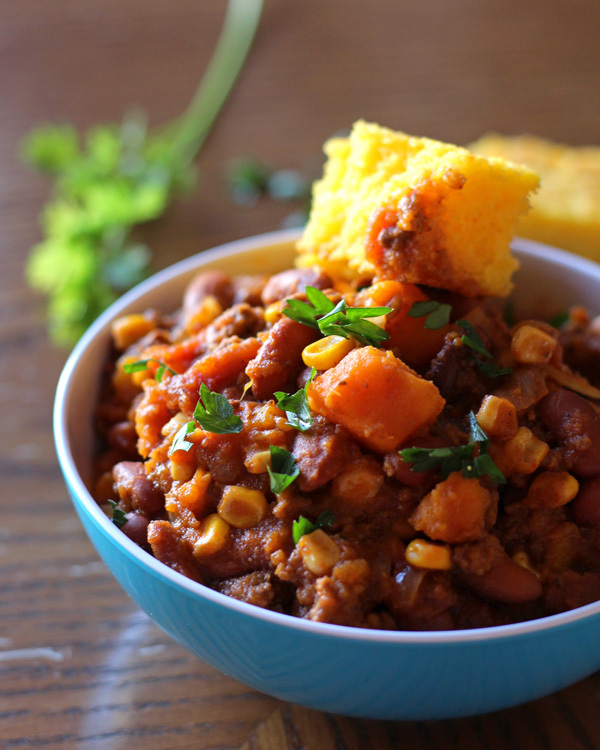 The addition of sweet potatoes gives this chili a healthy kick. Did you know that sweet potatoes are considered a superfood? 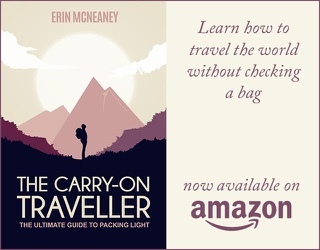 On this site I always try to feature internationally inspired recipes with some background information. So I did a little research on the origins of chili. The combination of beans and chili always made me think of chili as a Tex Mex dish, but I guess it is a little more Tex than Mex. It goes back to the times of the frontier settlers and is now the official dish of the state of Texas. In its original form chili was a brick of dried beef, suet and chili peppers which could be cooked with water for a quick stew on the road. You’ll notice that both beans and tomatoes are missing from the original and there is some dispute whether these 2 ingredients belong into chili or not. I only know chili with beans and tomatoes and since making this sweet potato version, I wouldn’t want to miss these awesome roots in it either. 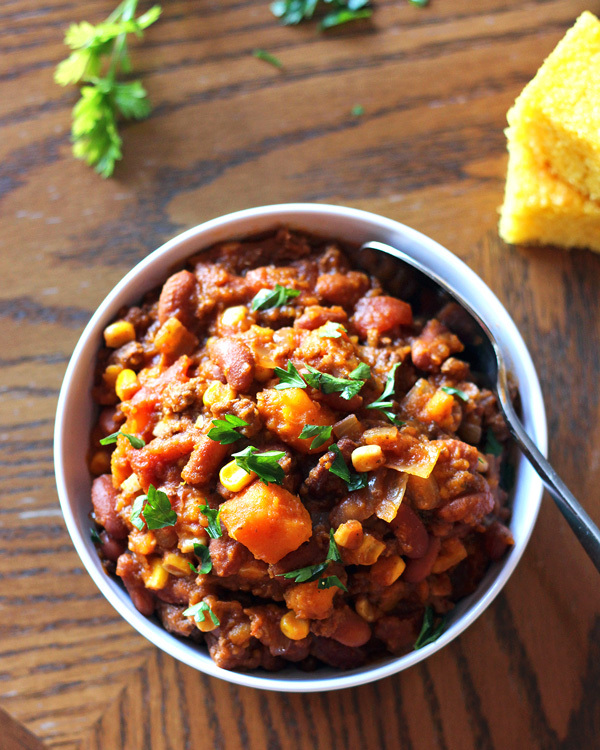 This hearty sweet potato chili is made in the slow cooker - perfect for cooler fall days. If using cooked beans, soak 1.5 cups kidney beans overnight, rinse and pre-cook while preparing the rest of the chili. Roast the corn until most pieces have a dark/charred corner, either in your slow cooker, if it has that function, or on the stove top. A dry pan or pot works best. Set aside corn and brown the meat (in slow cooker or on stove stop). Combine all ingredients in the base of your slow cooker and stir to mix well. Cook on low for 8 hours. 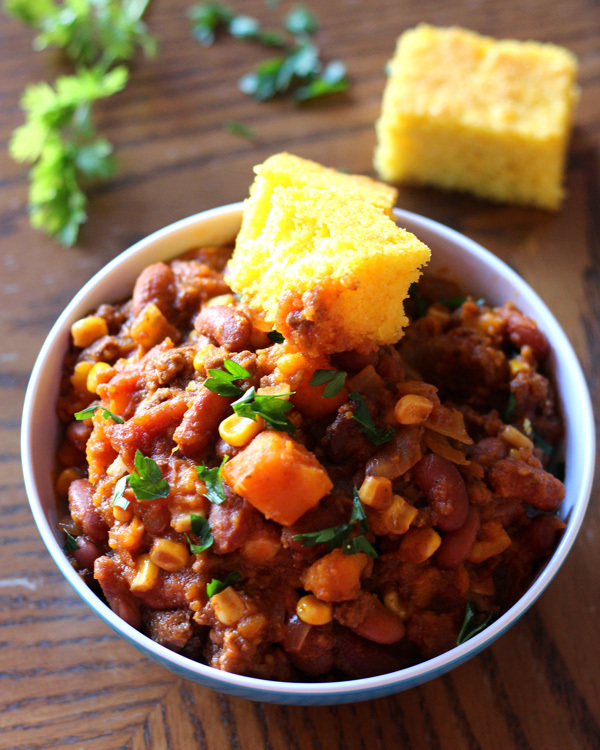 Serve chili with sour cream, shredded cheese, green onions or parley and some fresh (gluten free) corn bread on the side. If I don’t eat beef but would like to add a meat, what would you suggest? I just cooked this recipe using ground turkey and it was wonderful! You could probably also cut up some turkey sausage or kielbasa too. 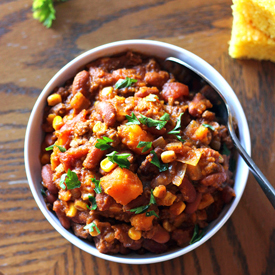 This chili is also the perfect recipe for the start of football season. I made it today and love it. I never would have thought of putting sweet potatoes in chili. But the potatoes blend nicely in the chili, and counter balance the heat from the spices. Thanks Regina! Do you know what size slow cooker this recipe fits in? I have a 3 qt. slow cooker and want to know if I have to cut down on the amt. of each ingredient. Can’t wait to try it! I agree. Food/Recipe writers and bloggers who write about slow cooking need to pay attention to this critical detail. The size of the slow cooker is often not given. This causes problems. I nearly wrecked a brand-new slow cooker (couldn’t find the old one) with an oatmeal recipe intended for a 5- or 6-quart slow cooker, not a 3-quart one. And you can’t simply guess and try to cut a recipe in half. The results won’t necessarily be the same. More importantly, thank you for giving us a plant-based slow cooker recipe. These are always appreciated. Yes, this makes a large portion of chili, so a 5 or 6 quart slow cooker is needed. Otherwise you’ll have to cut it in half. Sorry for omitting this in the instructions. For many years I was only familiar with the standard 6 quart slow cooker. I’ve only recently started seeing smaller and even bigger ones. No meat necessary. I found this delicious recipe last year and made it multiple times during the season. I’m excited to kick off another season with a crock full on today! This was very good. I made this today with the beef and I added extra chili powder for some spice and the hubby and I loved it!! Sweet potatoes was a great addition, added good flavor and a different texture. Thanks for a great dinner! Great recipe, so delicious. A little watery – not sure if it was the recipe or me adding extra stock – reduced it in a pot after and it was perfect. I did add some meat but I don’t think hubby would have noticed if it wasn’t in there. This was such a delicious chili recipe – the spices are spot on! Thank you so much for sharing it. This recipe looks amazing, but I’ve got loads of beef broth that needs to be used. Would using beef broth change the flavor for the worse? Should I add more spices so the beef flavor isn’t overpowering? For the vegetarians out there this recipe is great with vegetable broth and veggie crumbles. I made this last night for my husband and our neighbors. It was a HUGE hit. Most chili recipes seem to involve cans and cans of ingredients, but this one had a rich taste without all of the extra sodium. I used local sweet potatoes and frozen corn and could not have been more pleased. This is my permanent “go to” chili recipe! With this recipe be good as a make ahead frozen meal? If so, would you just cook the ground beef and then add that and all other ingredients to a ziploc bag to place in freezer and cook later?